Despite only being founded in June 2000, Betfair is certainly one of the bigger names on the UK betting scene… but not necessarily for its sportsbook. The brand is arguably more famous for its betting exchange, which allows users to wager directly against one another, rather than against the bookie. 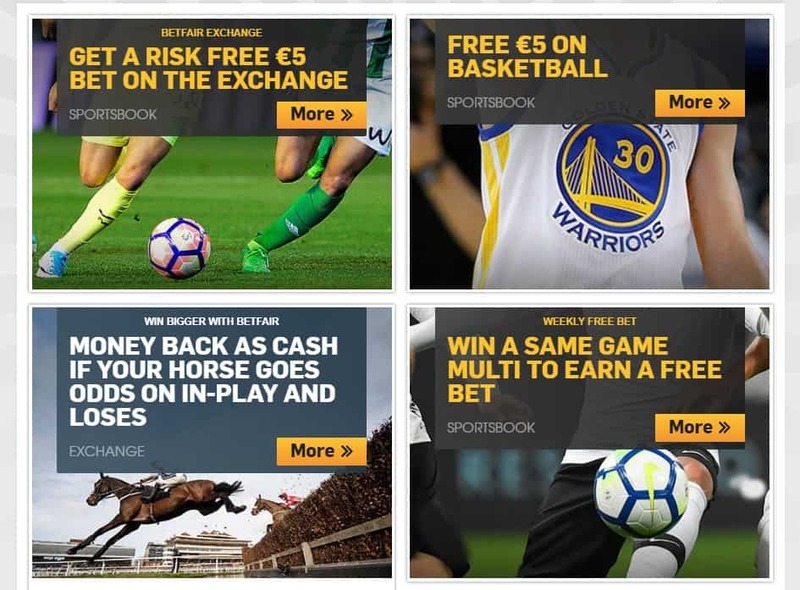 Betfair’s sportsbook is still a huge part of its business, though, and deserves to be evaluated alongside the other biggest bookies on the market. Indeed, the fact that you essentially get a celebrated betting exchange thrown in alongside a fully-fledged sportsbook actually makes this a very appealing proposition indeed, straight away! 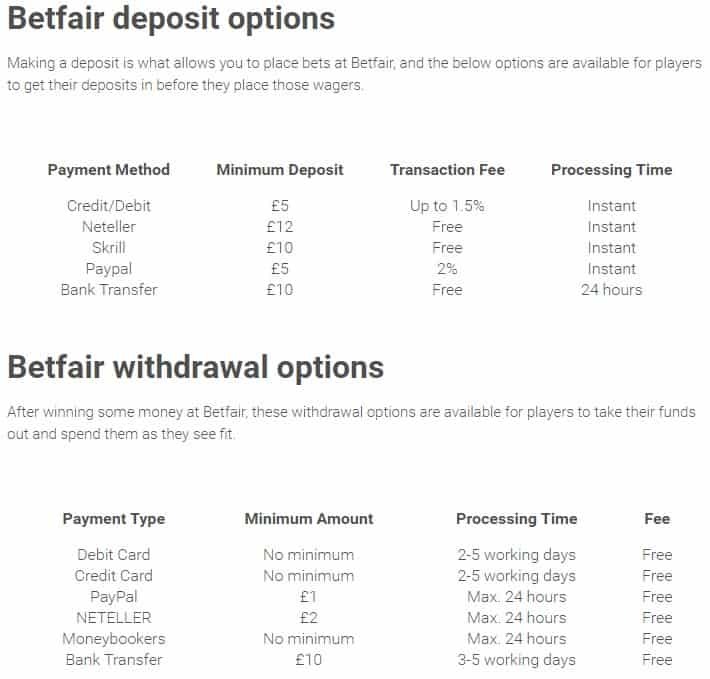 How does Betfair’s offering compare with sportsbook-only betting sites? Have they paid as much attention to this side of their business as they have to their exchange? It’s time to find out, in my comprehensive Betfair football review. High Bonus but Not Easy to Achieve. One of the Best Apps. Amazing Interface That Excels in Football. It goes without saying that even the big names, like Betfair, want to keep new customers coming in regularly. A killer welcome offer is the perfect way to do just that. 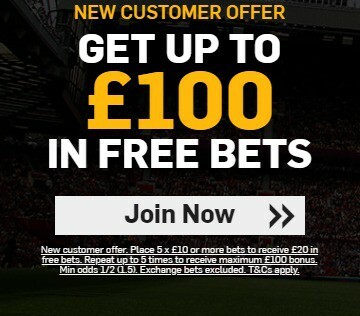 Unfortunately, the Betfair new customer offer – “Get Up To £100 in Free Bets” – falls well short of being “killer”. In short, it works by giving you a £20 Betfair free bet when you place five bets of at least £10. Do that five times, and you’ve got your £100. This is far from being the most generous deal on the market right now. The “Bet X, Receive Y in Free Bets” offer type is a common one… but you normally have to bet far less of your own cash to get the free bets. At the time of writing, for example, William Hill are offering new customers a “Bet £10, Get £30” offer. Paddy Power and Ladbrokes have similar deals. Compared to those, betting £50 just to get a £20 free bet – as you do on Betfair – simply doesn’t represent good value. To get the maximum £100 return, you’d need to bet through £250. That’s a proposition that probably won’t interest the casual gambler. Whilst the welcome offer is the first thing a prospective punter will look at, a bookie’s ongoing promotions will be a close second. These can also, of course, help long-term customers to stay loyal. There are no football-specific offers whatsoever, which is… surprising, to say the least. I understand that Betfair are a horse racing-focused bookie, but football is the nation’s favourite sport to bet on. With that said, the horse racing offers are certainly solid. The ITV Racing promotion is particularly impressive. If you bet on the winning horse (in a live race on ITV) at odds of at least 3/1, Betfair will give you a free bet equal to your initial stake, up to £25. Elsewhere, there are a couple of respectable general offers. There’s a referral scheme, wherein – if you get a friend to sign up, and they place £50 in bets within 30 days – you receive £20 in free bets. Betfair have also partnered with Rewards4Racing. Every time you place £1’s worth of bets on any sport (not just racing) you receive points, which can then be spent on this rewards programme. And… that’s just about it! Betfair’s ongoing promotions are entirely unexciting, and – on their own – certainly won’t tempt you into signing up. I’ve already mentioned the quite stunning fact that there isn’t a single football-related Betfair offer. Fortunately, this proves to be the blip amongst an otherwise impressive set of football features. Football enjoys its own dedicated section on Betfair, as it does with most (but not all) major bookies. What differentiates Betfair, however, is the ridiculously stripped-down interface. When I first saw it, I thought it was too simplistic – that it indicated a feature-light section. This was not the case. Instead, all the features you’d expect from a big-time bookie are present and correct. They’re just really, really easy to find. 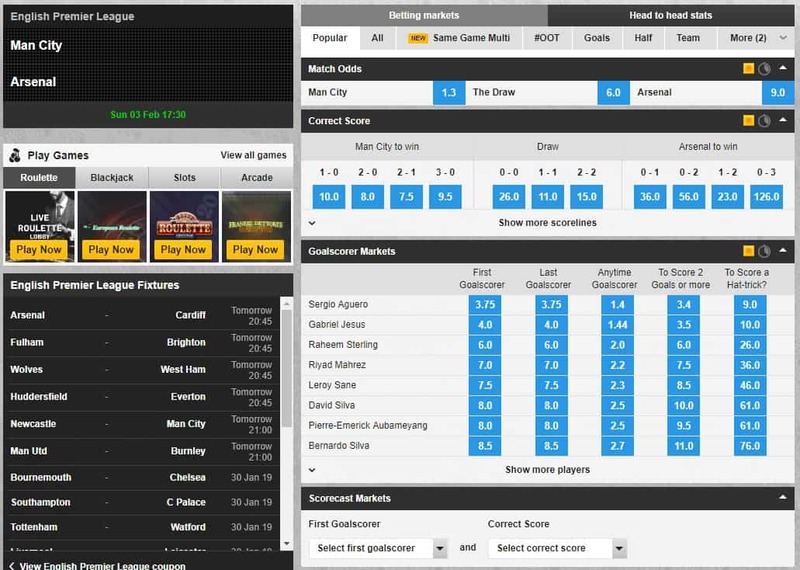 Every live game is automatically displayed on the home page, ready to be bet on in-play. The major European competitions – Premier League, FA Cup, La Liga, Serie A, and so on – are all laid out just above. Click on one, and you’ll be shown all the upcoming games for that tournament immediately. All the other competitions, basically in the entire world, are found in an easily-accessed sub-menu. Pleasingly, when you click on a competition and see the games, you can choose which odds you want to look at – Over/Under 2.5 Goals, Both Teams to Score, and so on – rather than just seeing the 1/X/2 full time result odds. Outright bets are equally easy to find. If you click on English Premier League, for example, they’ll be displayed right above the upcoming games – League Winner, Top Goalscorer, Relegated Teams, and so on. I could rave about this interface all day, but there are a couple of other cool features to mention too. Alongside the aforementioned in-play betting, there’s also a Betfair cash out feature, and a live streaming service which allows you to watch some of the biggest matches going, including Ligue 1, Serie A and FA Cup showdowns. Finally, there’s the quite bizarre Virtual Football feature, in which you basically watch two AI-controlled teams play a video game, and bet on the winner. Why you’d ever want to do this, I have no idea, but it’s kind-of fun! 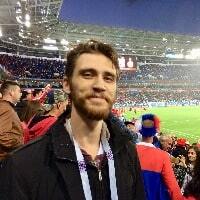 Betfair’s football features get a big thumbs-up from me. The interface for all of these sports is just as streamlined as that for football. Live streaming is also available for most major sports, such as racing, tennis (including grand slams) and darts. Horse racing is probably the most detailed other betting market, in terms of sheer races available to bet on and – as I mentioned earlier – special offers. It goes without saying that any respectable bookie nowadays needs to have a mobile app in place. The Betfair app, though, might just be one of the best in the business. The layout, whilst slightly different to that on the desktop version, is just as intuitive. You can access every important section straight from the home screen, whether it be your open bets, your account, the cash out feature, or – of course – the most popular betting markets. The Betfair mobile app excels visually too. The black and yellow colour scheme looks fantastic, and having simple black text on a white background makes everything nice and easy to read, even on a small screen. You’ll find all the same features here that you would on the desktop version. In-play betting works flawlessly, with odds being updated swiftly, and your wager being placed almost immediately. The live streaming genuinely might be the best I’ve encountered on a betting app. The streams load quickly, and the quality is excellent. It’s at least as good, if not better, than what you’ll get from something like Sky or BT Sport. This app is available for both Android and iOS devices, and has received excellent reviews from both sets of users. The current version of the Betfair Android app is averaging 4.5/5 from over 2,400 reviews, with the iOS app receiving 4.7/5 on 37k reviews. If on-the-go betting is important to you, this really might be the best option on the market right now. To their credit, Betfair make the signup process – which can often be annoying with bookies – as quick as painless as possible. Everything is handled on one, single, well-organised screen. You input all your data here – name, date of birth, etc. – and create your username, password and security question. On the next screen you can make your first deposit straight away, without having to verify your account via email, which helps to speed things along. You can also set a deposit limit here, if you so desire, which literally takes mere seconds to do. Once you’re done on that screen, the betting can commence immediately! We’re all for giving smaller bookies a chance… but there are benefits to going with a big name! One of those is a wide variety of banking options, and Betfair checks this box ably. You can use a credit or debit card, Neteller, PayPal, Skrill, paysafecard and bank transfer to make transactions. The minimum deposit amount varies depending on your chosen method. For debit cards, for example, it’s £5. For Neteller, it goes all the way up to £12. All deposit methods are processed instantly except for bank transfers, which take 2-5 working days. Betfair withdrawals must be made using the same method as the deposit. Again, the processing time varies depending on the method, but credit card withdrawals take 2-5 working days. The question “Is Betfair legit?” is probably redundant. Of course it’s legit – it’s a massive company! It’s still important to check, however, whether or not Betfair are doing everything they can to protect your data. This is an area in which most bookies don’t give a lot of information. Betfair distinguish themselves from the competition in this respect, which is great. They have a a full, detailed page on their security measures. Along with just saying “security… is a top priority”, they actually explain how they provide it. Amongst Betfair’s security measures is two-factor authentication, which is easy to implement, and SSL encryption. They’re also independently audited, registered with a variety of organisations, and have a great deal of physical security protecting their data centers. Frustratingly, this is an area in which even the biggest bookies often fall down. I’m pleased to say that this is not the care with the Betfair customer service, which is truly fantastic. There’s a lovely wide range of ways in which to contact Betfair. The fastest methods are live chat (which is a little tricky to find, admittedly) and phone (between 07:30 – 00:30). Betfair are also admirably active on their social media accounts, particularly Twitter, on which they respond to a large volume of enquiries every day. Finally, there’s also a big old FAQ section, which will answer most of the questions you’re likely to have. I don’t love the layout here, but it’s certainly usable, and the articles are written in a clear and helpful manner. Customer support is an area in which Betfair excels. In terms of big-time bookies, Betfair – founded in 2000 – are certainly one of the younger names on the block, especially compared to the likes of Ladbrokes (1886) and William Hill (1934). Betfair have achieved a lot in a short amount of time, however. They are a truly global company, operating in various capacities across Europe, North America and Australasia, and have some 2,000 employees on the books. Part of Betfair’s success comes down to their innovation. In fact, in 2003 they became the first bookie to sponsor a football team in England. Nowadays, of course, this is a common and lucrative practice. Betfair’s bosses agreed a merger with Paddy Power in 2016, to form the gambling titan Paddy Power Betfair. They are headquartered in Dublin and London, and also have significant operations in tax-friendly Gibraltar and Malta. Frankly, I’m baffled as to why Betfair’s promotions are so bad. Neither the welcome offer nor the ongoing promotions are going to entice… well, just about anybody to sign up. This is a real shame, because the rest of Betfair’s offering is absolutely excellent. The stripped-down interface is flawlessly intuitive, on both desktop and mobile. And, speaking of mobile matters, it’s no exaggeration to say that the Betfair mobile app might be the best I’ve used. In summary, I’d ask you to look beyond the lackluster offers, and give Betfair a shot. Between their customer support and variety of impressive features, they truly are one of the best bookies going right now.